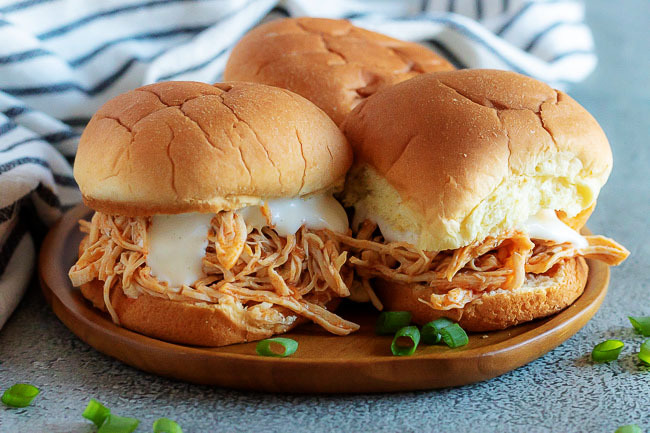 Instant Pot Buffalo Chicken Sliders are a perfect game day appetizer option! They are spicy, tangy and easy to customize with your favorite toppings. Hey, everyone! It’s Kim from Berly’s Kitchen. (Note from Jenna- Go check out Kim’s site and follow her on Instagram, Facebook, and Pinterest. She has mouthwatering recipes!) A couple of years ago, Jenna did me a huge favor when my family was in the path of Hurricane Irma. She knew our blog would be out of commission for a few days and offered to write a guest post. 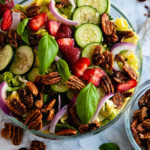 When Jenna approached me about guest posting for Seasoned Sprinkles while she took some time to care for her sweet, new baby, I was thrilled to help. 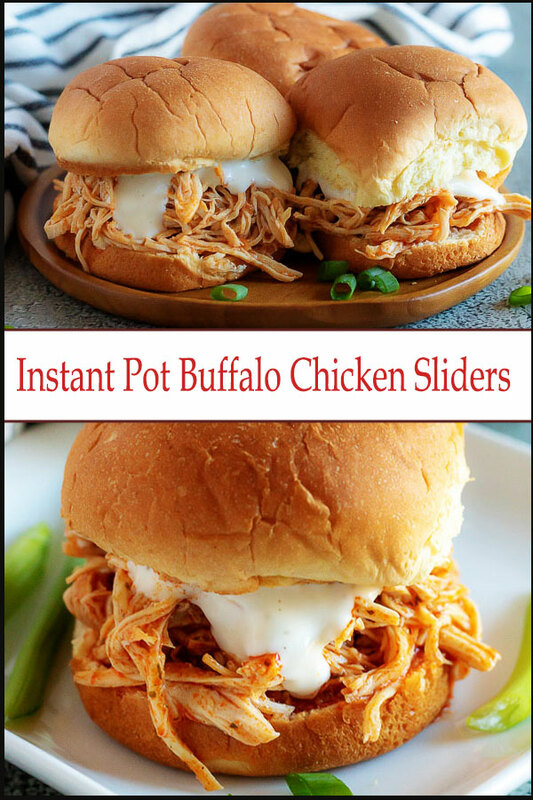 The idea for Instant Pot Buffalo Chicken Sliders has been swimming around my head for a while now. I never could find the right time to publish it on my site, and now I know why. It’s home is here. 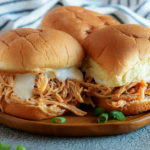 These buffalo chicken sliders will fit in well with the Bacon Wrapped Buffalo Wings and Cheesy Buffalo Chicken Dip that Jenna has already shared with you. These chicken sliders are incredibly easy to make. They are great if you’re throwing a party or get together. One of the best parts is people can add their favorite toppings, so each slider is unique. 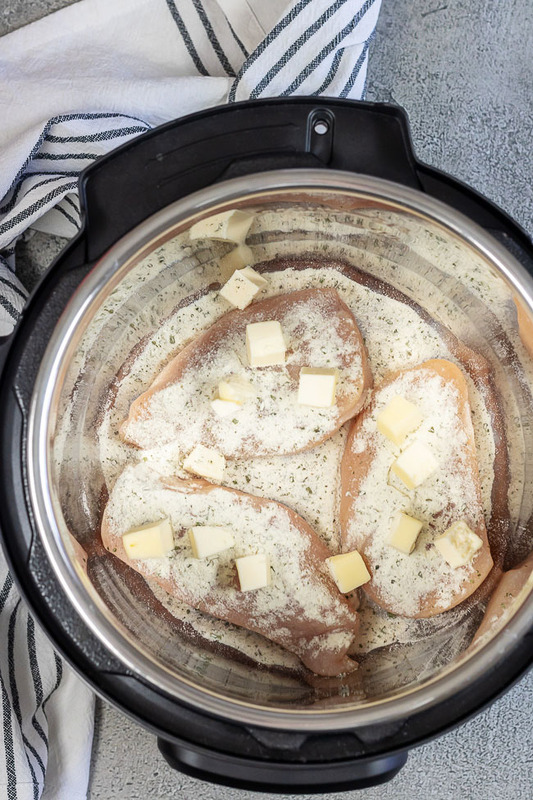 Start by laying the chicken breasts in the liner of the Instant Pot. I opted not to saute them, but that’s definitely an option. It will help lock in juices, so they don’t dry out. Next, sprinkle the ranch seasoning over the chicken breasts. Don’t worry if some of the seasoning gets onto the bottom of the liner. The liquid added to the liner will keep it from sticking and burning. Now, take 4 tablespoons of the cubed butter, and place it on top of the chicken. It’s okay if some falls off. Carefully pour in the chicken broth and hot sauce. Close the lid, and make sure the valve is set to the sealing position. Use the manual (pressure cook) button to adjust the time to 15 minutes on high pressure. After the time is up, allow the Instant Pot to complete a natural release for 10 minutes before opening the valve to quick release any remaining pressure. The natural release helps keep the chicken tender. If you do a quick release too soon, the chicken will become tough and rubbery. Carefully remove the lid, and use two forks to shred the chicken breasts. Add the remaining tablespoon of butter, and stir until it’s completely melted. This helps pull the sauce together and adds a bit of richnesses. However, it is totally optional, so feel free to leave it out altogether if desired. 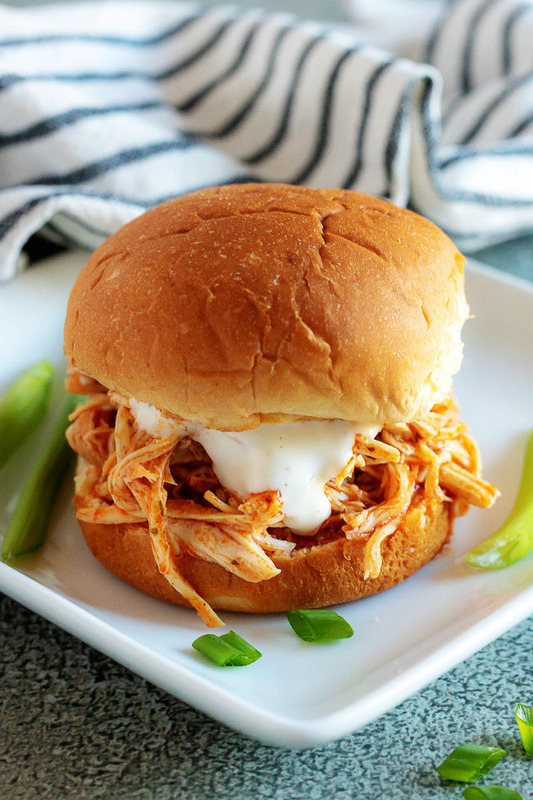 Let the chicken sit in the sauce for a couple of minutes before placing it on your favorite slider buns. 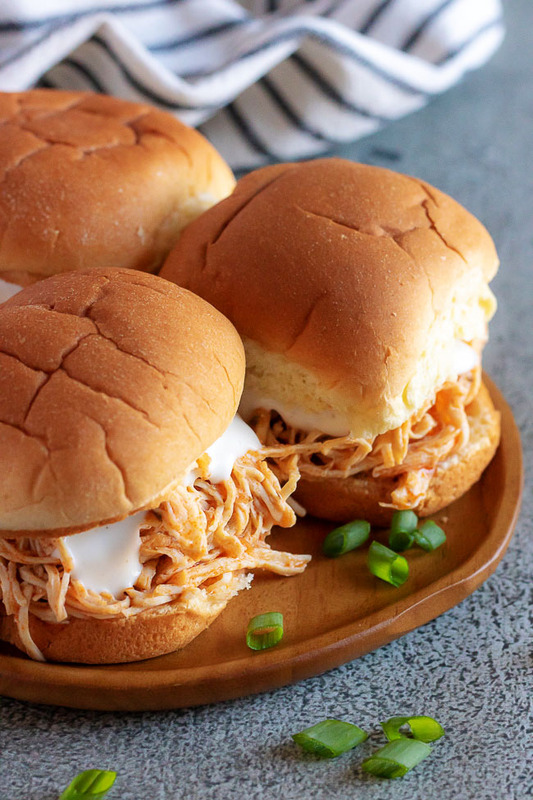 Top off these buffalo chicken sliders with ranch or bleu cheese dressing, cheese slices, cole slaw, green onions, or any of your other favorites. 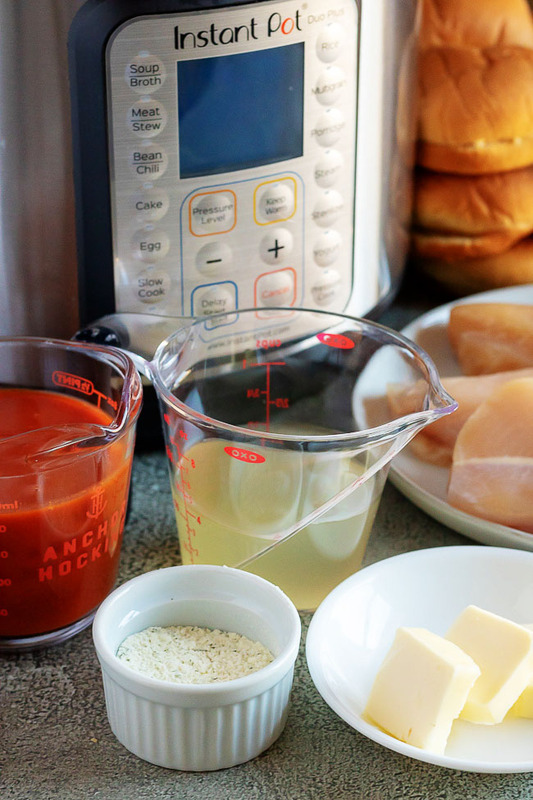 One of the most common questions I see regarding Instant Pot chicken recipes is, “How long do you cook frozen chicken breasts in the Instant Pot?” There is no need to change the length of cook time for these buffalo chicken sliders. The only part of the recipe that will take longer is the time it takes the Instant Pot to come to pressure since the chicken is frozen. I’m huge on doing things the way it’s easiest for you, so here is a preparation variation. 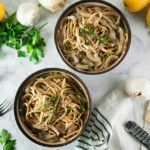 In regards to shredding the chicken, using two forks is super simple, but using a hand or stand mixer is a cinch, too! After removing the lid of the Instant Pot, remove the chicken and place it in a separate bowl. Use your mixer to shred the breasts. It literally takes seconds! Return the shredded chicken back to the sauce. Doesn’t get much easier than that! Swap out the hot sauce for buffalo sauce, and omit the butter and ranch seasoning. 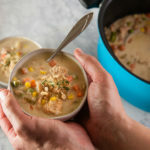 You’ll still need the chicken stock, so the Instant Pot can come to pressure but it makes for a simple short cut. Speaking of sauce, the buffalo sauce in this recipe is on the thinner side. To thicken it up, make a cornstarch slurry by adding 2 tablespoons of cornstarch to 3 tablespoons of cold water. Whisk to combine. Turn on the Instant Pot using the saute function, and add a little of the slurry at a time. Stir to combine. Add additional slurry until the desired thickness is reached. 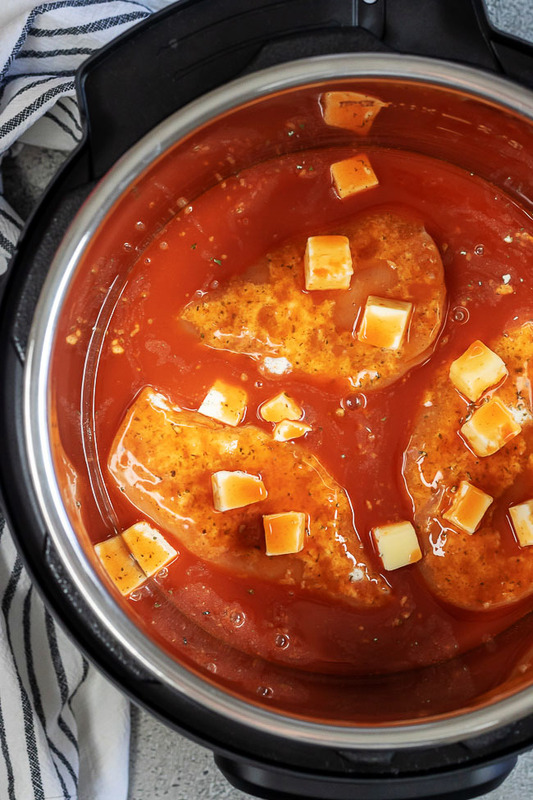 Place the chicken breasts in the liner of the Instant Pot. Then sprinkle the ranch seasoning on top of the chicken. Take 4 tablespoons of the cubed butter, and place the pieces on top of the chicken breasts. Reserve the last tablespoon of butter for later. Add the chicken broth and hot sauce to the pot. Close the lid, and use the manual (pressure cook) button to adjust the time to 15 minutes on high pressure. After the 15 minutes is up, allow a 10 minute natural release. Carefully remove the lid, and shred the chicken with two forks. Let the chicken sit in the sauce for a couple of minutes before placing on a bun with ranch or bleu cheese dressing, cole slaw, or your other favorite condiments. 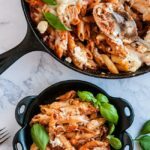 Shop this Instant Pot Buffalo Chicken recipe!